Happy Friday!! Who’s excited for this 3-day weekend?!?!?! I am so ready for it, and I have so much going on! My gal pal Lauren is getting married this weekend, and I have been looking forward to this wedding for months! Even more exciting, the wedding is formal attire, and I love any excuse to get all dolled up! I used Rent the Runway for my formal look, and my dress will be arriving today. I picked it out over a month ago, so I’m excited to see it person. Bonus, my BFF and I decided it would be fun to get our hair done too. It should be a fun day, and it will end with wedding cake! I LOVE wedding cake ya’ll!! I’m also planning to take advantage of a few Presidents’ Day Sales with a little shopping. A few months ago, I majorly cut dairy and sugar out of my diet and really focused on more plant-based meals. (Probably why I’m so excited for that cake 😉 ) I did it for the health benefits, but bonus I also lost weight and need some new work pants. So Banana Republic and Loft , here I come. I have to go to the store and figure out new sizes, so I’m hoping the malls aren’t too crazy with sale shoppers. We are finally starting to have Spring weather here in Houston. I know some of you are still dealing with snow, but our weather is supposed to be in the 70s almost all of next week. I’ve lived in Texas all my life, and I’m not the biggest fan of the cold winter weather. Needless to say, I am happy to see our winter almost over! We always get that one last sneak attack around the end of February though. 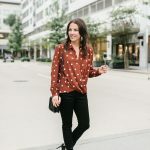 I figured with our warm week ahead that I would share a cute winter to spring transitional look. 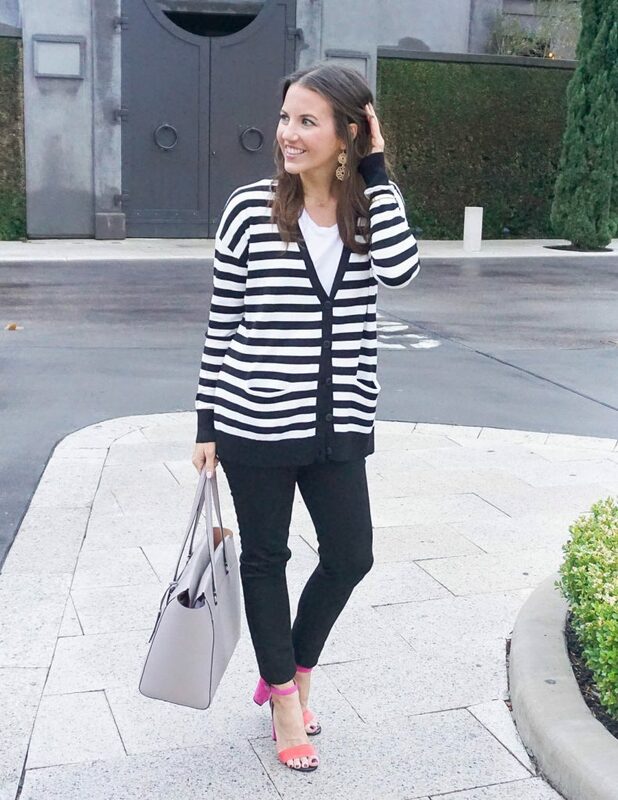 This outfit is a great example of how to wear a striped cardigan in Spring. This time of year, I am all about the layers. I also like each layer to look cute on it’s own. 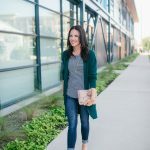 This cardigan is lightweight and could easily be worn over a colorful top too. The base layer is a plain white tee which with a slight front tuck would work without the cardigan too if the weather is too warm. Ya’ll, I found my favorite color block sandals back in stock and on sale this year! These block heel sandals are the perfect compliment to so many outfits. I love them paired up with this striped cardigan. They add the perfect pop of color to the black and white look, plus the open toe sandal style makes this outfit even more Spring ready. I hope ya’ll have a great weekend ahead, and thank so much for stopping by and reading! Those shoes are so cute! I love the colors. Thanks for joining the linkup. I love all things striped! I just can’t get enough of them. I love the way you paired the basic outfit with some fun bright coloured shoes for a pop! 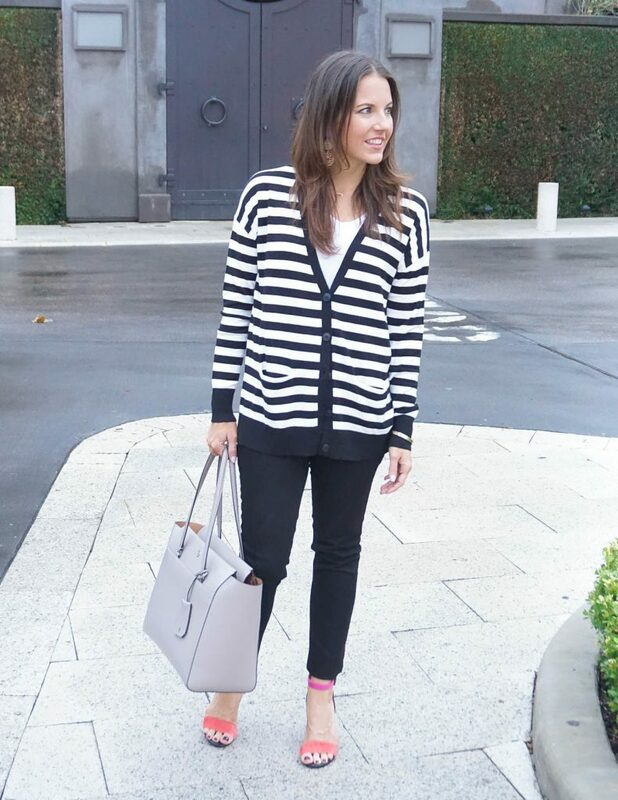 Love this striped cardigan! Such a great transitional piece and perfect with your pink sandals. Thanks for linking up with Fabulous Friday, Karen!